Anything feels possible with Antonio Brown, who's coming off a five-year stretch that reset the game's standard for open-field playmaking. In his 20s, Brown used his breathtaking footwork to create separation in the discussion of the game's best modern wide receiver. He's made the 100-catch season more a ho-hum expectation than an achievement. On July 10, he turns 30, a number often stigmatized in an increasingly youth-centric game. 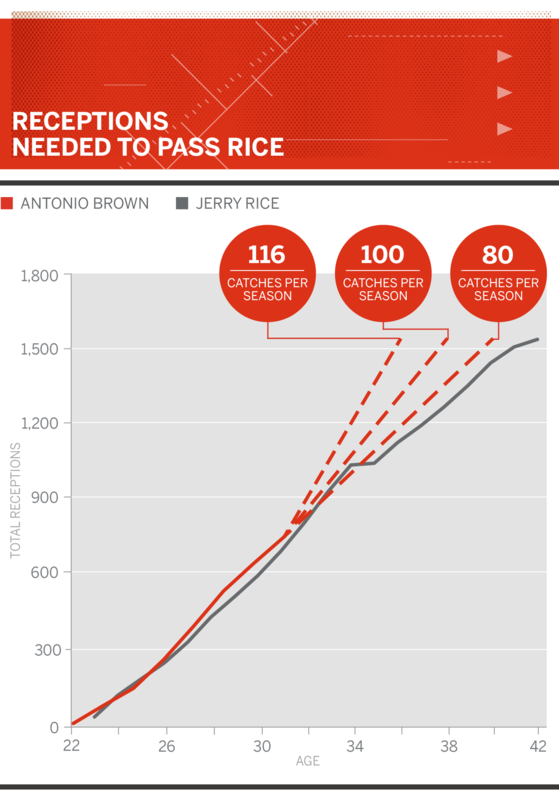 But if Brown avoids injury, dips into Larry Fitzgerald's longevity tub and really wants to chase all of Jerry Rice's stats, maybe he's just getting started. Flips into the end zone. Helmet catches. Enough insanely difficult sideline plays to earn the nickname "Tony Toe-Tap." The diverse arsenal of playmaking helped Brown become the best sixth-round pick, save Tom Brady. Consistency drives Brown's greatness. In 2017, he set an NFL record with a fifth straight 100-catch season -- and made a compelling MVP case with 1,533 yards -- despite a Week 15 calf injury that ended his regular season. No other player holds two of the top 10 performances in NFL history for single-season receiving yards. His hands rarely disappoint. Steelers quarterbacks have thrown Brown's way 512 times since 2015, against every type of coverage, and Brown has seven drops during that span. He lines up all over the field. He can beat man. He can beat zone. And he loves making contested catches. "Grab that," says Brown when asked about his mentality when the ball is in the air. He became the seventh player in NFL history to record at least 600 receptions and 9,000 receiving yards before his age-30 season. Brown reached 700 career receptions in the fewest games in NFL history (111). He led the NFL with 1,533 receiving yards and has 7,848 yards since the start of 2013, surpassing Hall of Famer Marvin Harrison (7,594 from 1999 to 2003) for the most receiving yards by a player over any five-year span in NFL history. 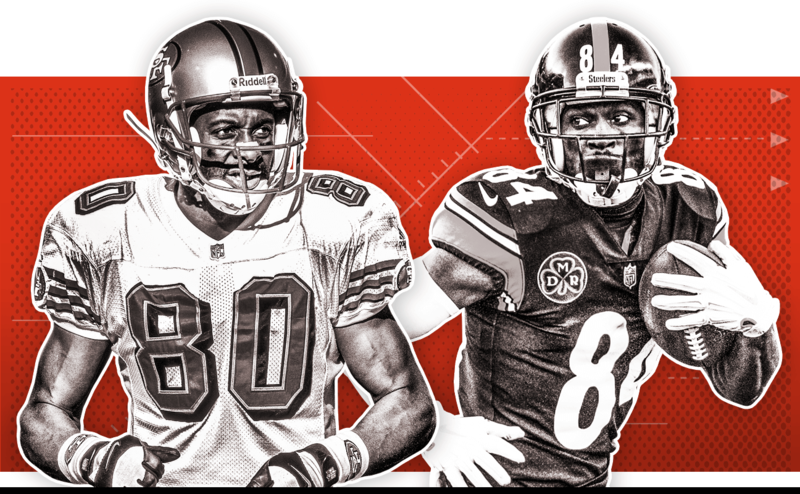 Brown, who has 582 receptions since the start of 2013, also surpassed Harrison (563 from 1999 to 2003) for the most catches by a player over any five-year span in NFL history. 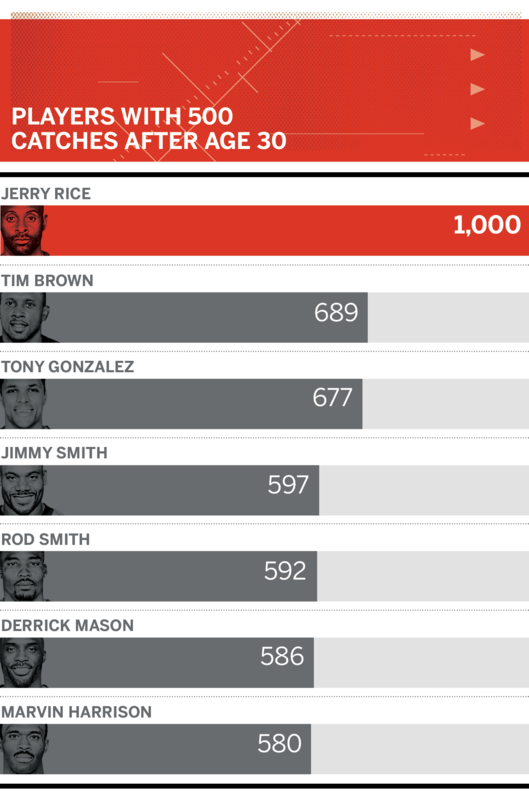 Hitting 30 barely slowed Jerry Rice. 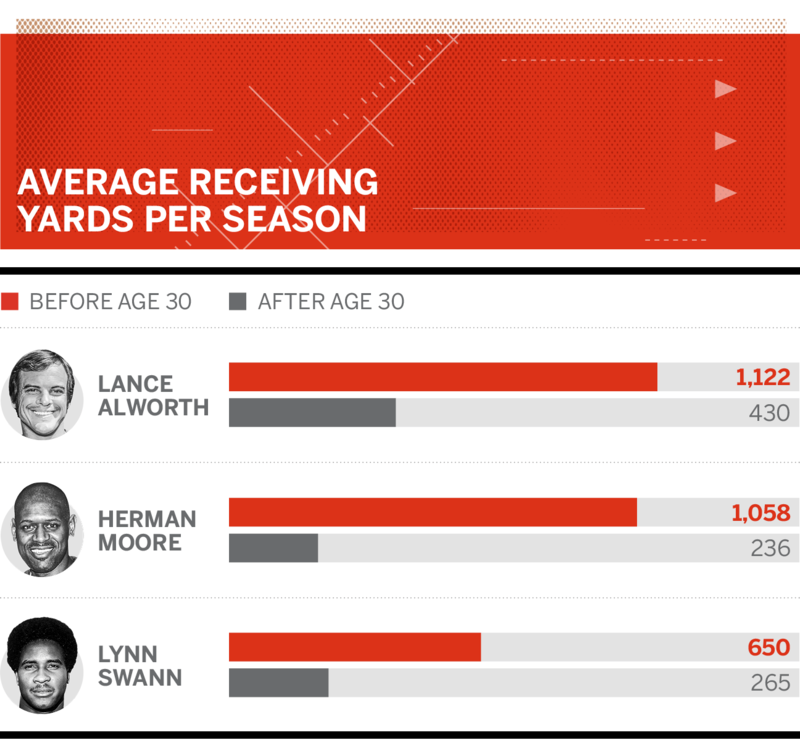 He led the NFL in receiving yards six times in his career, and three of those came after his 30th birthday, including an 1,848-yard season in 1995 during which he turned 33. Rice posted three of his four career 100-catch seasons after 30, leading the NFL with 108 in 1996 at age 34. Here are the players age 30-plus on Dec. 31 of that season who led the NFL in receiving yards. Can he catch Jerry Rice? The answer to whether Brown can handle the challenge of turning 30 can be found in his countless workout videos on social media. No one trains quite like Brown, teammates say. "I don't pay attention to my age," Brown told ESPN. "I'm feeling great, I'm healthy and I'm in great shape. I feel as long as I have that, I can continue to be productive." There's no question about Brown's youthful exuberance. He rarely sits still for long, bouncing to various gyms and football fields around the country each offseason. From Russell Wilson to high school kids, he'll train with anyone. The way Brown sees it, refine the skills, and the numbers will follow. "Life is all about challenges and working to be the best," Brown said. "You never want to limp away from the game." 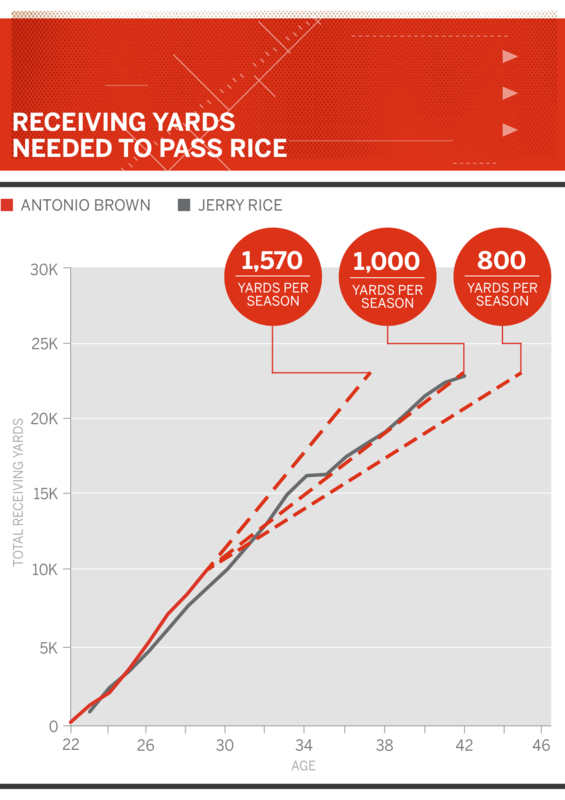 From a numbers standpoint, catching Rice and his NFL-record 1,549 receptions and 22,895 yards will be a big challenge for Brown, who has averaged 1,239 receiving yards and 91.6 catches per season so far in his career. Every receiver suffers a drop-off eventually, but Brown can prolong things with durability, a graceful skill set and elite quarterback play. Brown hasn't missed more than three games in a season since becoming a starter in 2012, relying on small-space quickness and savvy over power and size. Many of Brown's catches come from near-indefensible plays along the sideline and navigating open pockets of grass with Ben Roethlisberger, who says he plans to play at least another three years. "We've got a pretty good connection," Roethlisberger said. "It's something special what you see on Sundays between him and I." Brown's biggest hurdle might be an uncertain supporting cast. With Martavis Bryant traded and Le'Veon Bell facing another franchise tag, Brown needs JuJu Smith-Schuster and rookie James Washington to draw safety help. Still, Brown has routinely solved double-team problems in the past. If he keeps his knees healthy, getting open should remain a way of life for Brown. Michael Facciolo and ESPN Stats & Information contributed to this story.